100 years ago this month, the body of a sailor came ashore in a small boat in a cove at Island, Stradbally. 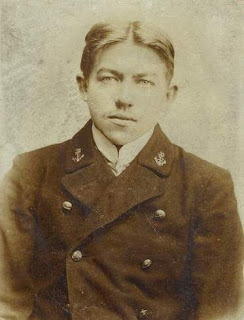 The sailor was 31-year-old Able Seaman Julius Paimal, originally from Estonia, and he was killed when his ship, the SS Pinewood, was sunk by a German submarine fifteen miles south of Mine Head on 17th February 1918. A group of local men recovered the body, and eventually succeeded in getting it to the top of the cliff. They were: Sergeant O'Connor and Constable Brown, RIC; James Cummins; William Clancy; Michael Cummins; Philip Cummins; Michael Kiely; Patrick Fitzgerald senior and Patrick Fitzgerald junior. Paimal's remains were interred in the Church of Ireland graveyard in Stradbally on 20th February. This was organised by the local dispensary doctor, Bryan Foley, and the burial was performed by Canon Burkitt. On Saturday 17th February at 3.00 pm there will be a short commemoration ceremony at Paimal's grave, to honour him a century after his death. All are invited to attend, and it would be particularly fitting if relatives of any of those involved in recovering Paimal's body 100 years ago were able to be there. There will be refreshments afterwards. For more information contact Cian Flaherty on 086-8961747 or email cianflaherty96@gmail.com.